Forget “Government Spending.” The Only Thing That Really Matters is Healthcare. the last 83 years has been for government spending to rise by 0.24 percent of GDP per year, and the correlation is strong: a linear regression on this trend has an R-squared value of 0.72, meaning that time explains most of the movement in government spending. But there’s another way to look at this too. 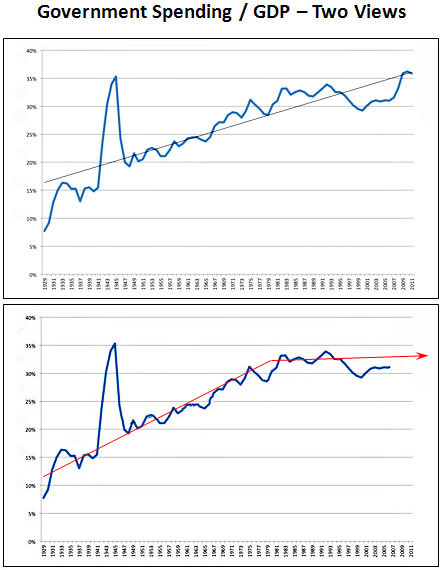 The chart on the bottom is my take: I’ve cut it off at 2007 so that the Great Recession doesn’t obscure the real trend of the past few decades: government spending increased steadily until the mid-70s, but since then it’s flattened out almost completely. Now, I agree with Barro that entitlement spending is certain to go up over the next 20-30 years as the baby boomers retire. But what the bottom chart shows us is that government expenditures in general haven’t been on an inexorable upward path over the past three decades, and there’s no special reason to think they’ll rise inexorably in the future. Generally speaking, domestic spending, defense spending, and Social Security are on extremely sustainable paths. What’s left is healthcare spending. That’s it. So this is basically just another excuse to repeat something that I and others have said over and over: We don’t have a spending problem in America. We have a healthcare problem. The other three categories of government spending taken together will probably rise by a point or two over the next few decades, but that’s not a big deal. We need to pay normal, prudential attention to them, but nothing more. Bottom line: no one serious should spend an awful lot of time talking about “the deficit” or about “government spending.” We should be talking about healthcare. Everything else is just a red herring.